“My name is Hughie Ah Won, I am a Wunambul man, my skin is Djubidja. I paint the Wandjina and stories that were told to me from my elders of the Wunambul tribal. I paint these stories hoping to pass them onto the younger generation of the Kimberley region”. Hughie Ah Won was born on Creswell Downs Station, Barkley Tablelands, NT in 1965. His father was working as a stockman on the station at the time. Hughie’s father, Edward Ahwon was from Spring Creek Station, WA and his mother, Gracie Ned was from Borroloola in the Northern Territory. Hughie, his brother Robert and sisters Susan, Marjorie and Audrey grew up and went to school in Wyndham. After Hughie finished school he worked as both a stockman and a house painter for several years before commencing work in government departments such as Aboriginal Legal Services and Children’s Services. Incredibly, given the depth of his talent, Hughie only started painting seriously in 2007. His inspiration to paint came from the old boab carvers in Wyndham. They hadn’t had the eduction that Hughie had, but they had life experience and incredible talent. His mentor was Octa Carroll (father of senior ochre artist Tommy Carroll) and then Alan Carroll and Leslie Evans. Hughie realised that people in Wyndham were interested in his artworks and started selling locally and in Kununurra for Waringarri Arts in 2008. In 2009 Hughie and his family moved to Adelaide temporarily where he entered an art competition for the creation of a calendar and his work was chosen to be represented for the month of April. In early 2010, keen to learn more of the technical aspects of painting, Hughie moved to Cairns where there is a huge art culture. Recognising his immense talent, a local gallery started working directly with Hughie. As well as painting his incredible artworks, Hughie also produced stunning etchings and lino cuts. Hughie now resides in Kununurra, East Kimberley with his family. Inspired by his country, he continues to create his amazing works. The exhibition of paintings by Sarrita and Tarisse King opened last night. There were a lot of new works and new styles by these amazing artists who are forever evolving with thought provoking paintings that, not only have a huge depth of knowledge about the country, but also relate really well to viewers who stand in awe of some of the huge canvases. Pommery Champagne commissioned Sarrita to paint a special series of works. These paintings featured on a new art label on their latest champagne bottles. Both the paintings and the bottles are on display in the foyer at the Hilton Hotel. More works on level 4 in the gallery. The paintings by SarritaandTarisse King can tell us a lot about the country that the two sisters grew up in. Their father, the late Bill King Jangala, taught his daughters about the countryside, the philosophies and about their ancestors. The elements also played an important role in the education of the two sisters, Fire and Water feature heavily in works by both of the sisters. Fire was the element that connected Tarisse to her ancestors and in turn her ancestors to the earth. The heat of the fire can be felt in her artworks and it is this feeling of warmth that her father said would be the same sensation her ancestors had experienced thousands of years ago. Water with it's life giving properties connects her to her father. Tarisse captures the movement and shimmer of the water as seen from above through her varied tonal use of blues and whites. Sarrita King paints the Earth Cycles, her father passed these down to her, teaching her about the connection between all people and the world around them. Water with its different geographical formations inspired Sarrita to seek and mimic the movement of this life-giving element. Listening to her father explain the dire importance of water to the Aboriginal people and culture, Sarrita feel that this element also connects her to her father. Shorty's paintings have been exhibited both nationally and internationally at numerous exhibitions, he is one of the true icons of Australian Aboriginal art. MENTION Aboriginal art these days and you're likely to hear a lot of doom and gloom. The global financial crisis, Labor's resale royalty scheme and its changes to superannuation really knocked the bottom out of the market, dealers say. But not the top, it seems. In galleries around the country, high value works, often large ones, are selling swiftly. "There's a bevy of artists whose work is trading at prices above what we saw prior to the downturn -- I would say at record prices for these artists in private sales," Russell Roberts, director of Piermarq Art Advisory in Sydney, says. Respected art valuer Brenda Colahan thinks sales have improved markedly in the past six months. "The top end is finding a market, perhaps privately, not at auction," she says. The most popular works tend to be by elderly desert artists, people who grew up in the bush before contact with Western civilisation. "People recognise there's a direct association between these works and a culture that's 40,000 years old and potentially coming to an end," Roberts says. Ken McGregor, an author and art adviser, argues many of the best paintings now being produced are monumental or very large. "Everything is on a big scale out there in the desert," he says. "There's something expansive that really lends itself to huge work. "Some of these paintings are really breathtaking." 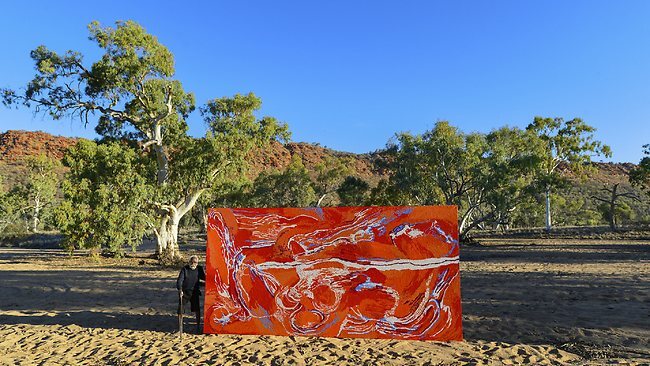 McGregor curated a show of works by the desert artist Tommy Watson at Metro Gallery in Melbourne, including one five-metre piece priced at more than $800,000. One of the biggest proponents of monumental works is Chris Simon of Yanda Aboriginal Art, who represents Watson and looks after him while he paints. "The downturn during the GFC was probably the best thing that could've happened to my business," he says. "It got rid of all of the small dealers who encouraged artists to paint more than they were capable of doing to high quality." He says he has since been able to coax the best artists to produce fewer, larger works that he hopes will provide a cultural record. There has long been a tension between private dealers such as Simon and the government-run art centres that dot the outback and keep many artists employed. Desert Mob, a highly regarded exhibition of work primarily from art centres, opened in Alice Springs this week. Art centre works tend to dominate competitions and public gallery shows. McGregor says even though many art centre operators are his friends, he thinks they don't always focus enough on quality. "The best work is really being produced outside art centres," he says. Dealers say most of the top end works, selling for prices from $10,000 to $130,000 and up, are going into private collections in Australia and overseas. McGregor thinks more should be going to institutions. If you want to see some of the most outstanding paintings ever done, then the works by Tommy Watson would have to be on your "must see" list. ABORIGINAL LAWMAN AND ARTIST, TOMMY WATSON, HAS BEEN PAINTING SINCE 2000 AND PRODUCED A RELATIVELY SMALL NUMBER OF MAJOR WORKS. TOMMY IS A SENIOR PITJANTJATJARRA ELDER WHO REGARDS HIS PAINTINGS AS HIS BEAUTIFUL COUNTRY. HE IS SYMBOLICALLY PASSING ON VERY IMPORTANT CULTURAL KNOWLEDGE IN EACH WORK HE DOES. The incredible attention to detail is reflected in every painting created. The fusion of colour, texture and form allow you to experience his country as it's depicted on canvas. TOMMY'S IMMENSE TALENT WAS RECOGNISED IN 2007 WHEN HE WAS ONE OF ONLY EIGHT ABORIGINAL ARTISTS THAT WERE SELECTED FOR THE PERMANENT EXHIBITION AT THE PRESTIGIOUS MUSEE DE QUAY BRANLY IN PARIS 2007. Red Desert Dreamings Gallery is located on the Yarra River, level 4 at the Hilton Hotel. If you're interested in Aboriginal art, a serious collector or just want to learn more about our amazing indigenous culture then please come and visit us. The art gallery is open throughout the week and there is someone in the gallery most of the time, but if you want to be certain a gallery member is there, give us a call, as we're always happy to talk with you about our favourite topic, Australian Aboriginal art and culture. The gallery has a huge collection of Aboriginal art, it was started by Kevin and Jenny Winward, both serious art collectors. Whilst the gallery does specialize in art from the centre and western desert regions of Australia, it also has an excellent collection of Aboriginal art from Arnhemland or Top End Art (as it's often known by), art from the Tiwi Is as well as the Kimberley in the far west of Australia. The Dalai Lama's visit to Red Desert Dreamings gallery with Kevin, Jenny, Lucas and Sam Winward. Red Desert Dreamings supports the artists and their communities. Aboriginal art has become popular world-wide helping many artists who want to remain in their community earn their living thru art. Red Desert Dreamings holds art exhibitions regularly, join our mailing list if you want to be advised when they're on. Apart from the gallery where Aboriginal art is exhibited throughout the year and open 7 days a week, we often take over the foyer at the Hilton Hotel, where we're located, so you can browse many of our artworks there. Artists such as Ronnie Tjampitjinpa, Clifford Possum, Mitjili, Minnie Pwerle, Turkey Tolson and Walangkura all are represented at Red Desert Dreamings, old masters that hold a special place in a serious art collector or investor's heart. These senior elders of the Aboriginal desert mob helped to put Aboriginal art on the world map and some are still alive and painting. Amongst the rising stars of the Aborigianal art world are Tarisse and Sarrita King whose contemporary works depict the Dreamtime stories going back over 40,000 years. The works by these two sisters are still very much in the "affordable" price bracket for most purchasers. Many collectors are now enthusiastically purchasing these two artists' works. Their paintings show knowledge passed down to them by their father and go back thousands of years, their paintings are fully resolved, but definately have that contemporary edge that bridge the gap between traditional Aboriginal art and modern day paintings. The future for these two sister's is looking extremely bright. If you're after a special painting for your home, office, boardroom or perhaps wedding gift or something special for an overseas guest then Red Desert Dreamings can certainly help you. We not only have an art gallery full of amazing works, but also a stockroom with many more paintings waiting to be appreciated by new owners. Guess who called into the gallery this week?? Wonderful surprise to catch up with Tarisse King when she called into the gallery this week with her family. Her little girl has certainly grown a lot and still as active as ever. Tarisse and her sister, Sarrita, are known for their paintings depicting the Earth cycles of this country. Tarisse's, Pink Salts, paintings (see pictured below) show the pink hues of the minerals that come up from the ground found in many of the lakes between Adelaide and Darwin. The detail each work is extraordinary and the emotion, knowledge and love of the land, plus the skill of Tarisse with a paint brush is making her works more and more in demand by art lovers and collectors worldwide. If you are considering a painting, where the value of each work is still at an affordable price, then Tarisse's paintings are certainly worth looking at. Their popularity has grown over the past year and this hard-working artist will, I'm sure, be painting up a storm for many years to come. Tarisse is an Aboriginal painter who takes her work extremely seriously and is constantly evolving, creating exciting contemporary art pieces that are fully resolved as only an artist who has the skill and knowledge of their subject can. If you're after an investment piece now is certainly the time to buy. One of Australia's prominent Aboriginal artists, senior Walpiri women,Dorothy Napangardi was killed in a car accident near Alice Springs last weekend. She was a winner in 2001 of the prestigious National Aboriginal and Torres Strait Island Art Awards and was regarded as one of Australia's leading indigenous contemporary artists. Born at Mina Mina near Lake Mackay in the Tanami Desert her painting career began in 1987 and flourished in the mid to late 90's. She grew up at Yuendumu, but spent most of her life at Alice Springs. She had little schooling but learnt about her Dreamtime stories that she painted from her elders. Her father was a senior lawman. Her works on Mina Mina and the salt plains have been purchased by galleries, museums and private collectors worldwide. Dorothy lived to the most part a traditional life and was out on a hunting trip with her family in the outback bush not far from Alice Springs when the accident happened. The most powerful image of The Kimberley is the Wandjina rock art, found in the caves of north-west Western Australia. The Worrorra, Ngarinyin and Woonambal people trace their ancestry directly back to the Wandjina spirit ancestors. Wandjina are only found in the Kimberley region, nowhere else in Australia. Each image of the Wandjina, painted on the rock caves, is said to have formed at the end of their creation activity on earth after they had created the land forms, the plants, animals and humans. At the end of their work they lay down in the cave and turned into a painting. This Wandjina is deeply spiritual to the people of The Kimberley area and a lot of the caves are now protected, many have been and still are hidden to protect them. These paintings are said to have been done from spiritual beings with no human intervention. Their image may be copied on bark, paper or canvas for commercial purposes, but their power is greatly diminished when it takes on another medium and painted by a human. Wandjina is a generic term and there are individual Wandjina's with individual names ie Jundart, Lightning Wandjina. All Wandjina, when painted, have similar features...they are always painted in full frontal, they have large "owl-like" eyes, long nose and no mouth. Although stories vary from clan to clan, it is said that if the Wandjina had a mouth and he opened it the rains and floods would come. Other's say having no mouth stops gossip and telling sacred stories. When the indigenous people of The Kimberley were displaced during early European settlement, the senior law men who were responsible for retouching the Wandjina in the caves weren't able to continue to do this important task. It had always been important to keep the painting fresh as this in turn meant that their sacred lands would also remain fresh. "I made you very good now, I don't know how I did it, very good. You must be glad because I made your eyes look like new. That eye, you, like this my eye, I made them new for you people. My eye has life, and your eye has life too, because I made it new. Don't try to bring rain, by wife might drown with rain. The rain might drown her....."
There has always been some debate whether the Wandjina is the oldest cave painting, older than the Mimi Spirit, but there does seem to be evidence that the Mimi did predate the Wandjina. The Wandjina has always been, and still remains, one of the most significant images of The Kimberley. Could Australia’s floral emblem hold answers for a hungry world?